I decided to run this SocialNetConomy Survey on Social Media adoption and social media budget to understand where do we stand with social media adoption and understanding. 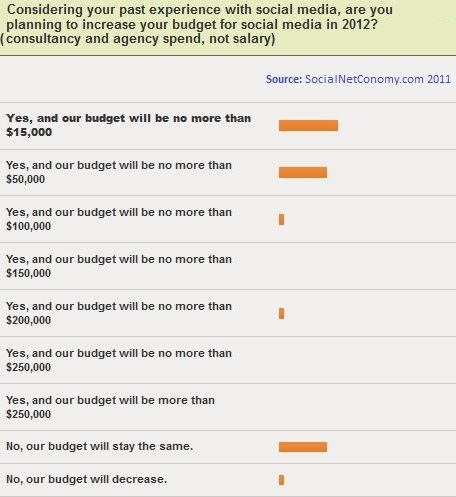 And, most of all, what social media budgets have been for 2011 and what they are going to be for 2012. Since Social media today are the talk of the town, whether you talk about Facebook with your friends or if you do a check-in in a place to show you travel and you go to fancy places (too often forgetting that your LinkedIn peers may not be interested to know where you go for dinner), or if you talk about social media during your business meeting, I thought it was good to understand how companies consider it. I had a feeling not all companies truly understand how big the impact of social media can be and what kind of opportunity they are missing if they stay out of it. I am glad to finally share results for my short survey – it was a 10-question survey. This survey has been realized using a free service (you can see the original survey on surveymonkey), and social media (I recruited people only on Facebook, LinkedIn and Twitter). Thank You to all my Twitter peers that helped me with this survey- too many to mention! A significant element of collecting responses has been the help I got from my twitter peers: I asked to ReTweet my survey to help me collect more responses, and thanks to all those who shared, retweeted and took the survey I am now able to share my results. I invite you to keep taking this survey, and sharing it. I will be happy to update this post if more responses come in. Participants to this survey come from US, Canada, Latin America and EMEA. Not much from AP. Almost all industries are equally represented, including Government, Consulting, Manufacturing, Retail, Energy, Finance, Health and Pharma, and companies analyzed include both those operating globally and those operating in a single region, country or locally. 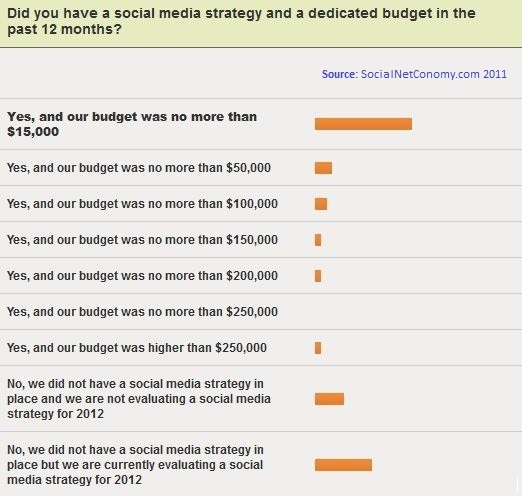 Q- Did you have a social media strategy and a dedicated budget in the past 12 months? 25% of surveyed companies said they did not have and they are currently planning any social media strategy. 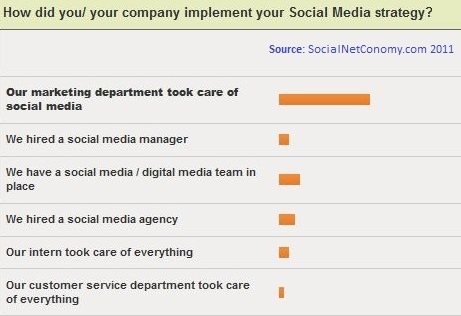 12.5% said they did not have a social media strategy and they are not planning any. Considering how I collected these answers, it’s interesting to notice that if they answered this survey, they got the link through a social network. Nevertheless, they do not consider this channel to be good for their brand exposure for some reason (inhibitors to Social Media adoption are part of this survey too). I believe this is pretty interesting. Talking about budget, about 65% of respondents have a social media strategy (so they say), with more than half of them saying their budget is no more than $15,000. It’s interesting to notice that about 20% of respondents said their budget was over $15,000. We discussed about this in my previous post: having a Facebook fan page does not mean having a social media strategy. It seems respondents are not always aware of this. In fact, not all social media are used the same way, and not all social media are used for their full potential (about half of those with a Facebook page use Facebook ads, not to mention LinkedIn PPCs are way less used – I suggest to follow the links to related posts to learn more about these PPCs). About half the interviewed companies use twitter and LinkedIn and have learned about the importance of a company blog. 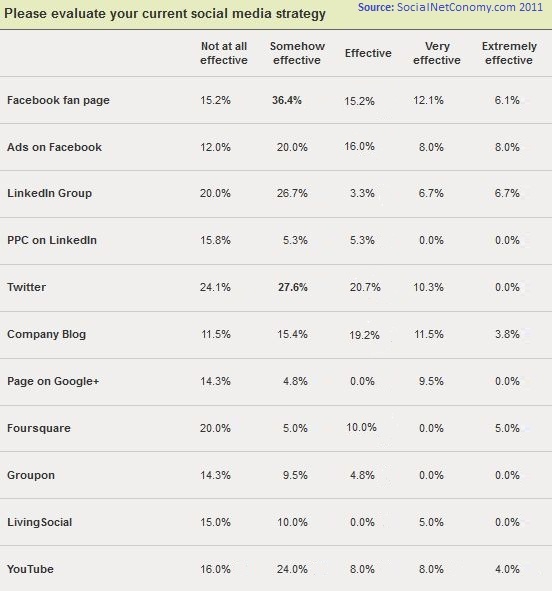 The next question was about the social media strategy effectiveness, which highlights something really important: While over 70% of respondents have a Facebook presence and half of them have Facebook ads, only 17% said this approach has revealed either “very effective” or “extremely effective”. The good news is there is a lot of room for improvements! 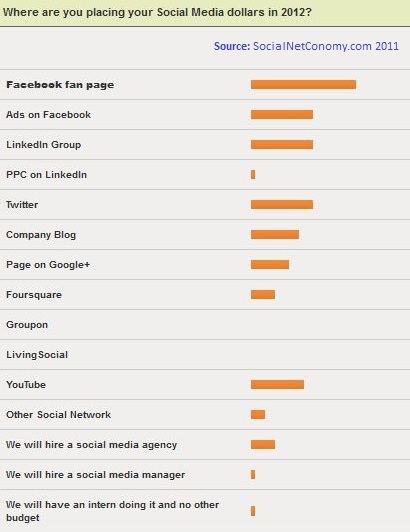 Ads on Facebook work better than Facebook pages (IMHO mainly because they are really well targeted), and company blogs, along with twitter and LinkedIn work very well too. Bad performance for Groupon, LivingSocial and similar solutions, as well as for preliminary Google+ company pages. A combination of all channels is surely highly recommended. Q. How did you/ your company implement your Social Media strategy? I have over 10 years of experience in marketing and social media, and I believe (I have experienced) the right approach to social media would be to have it as part of both a business’ marketing strategy (you are telling something to your clients on their preferred channel!). and a customer service / channel with a direct contact with customers (they are now expecting it to be this way), for companies to listen to customers. What you write on social media stays and should be handled no less than a press release or TV ad: with care. Given that I noticed a few companies don’t believe in social media, but they often do it because they have to, they don’t really pay attention to it, and they don’t care about who, what or when it’s done. So I asked who was taking care of social media to the surveyed companies. Results confirm there is a lack of cultural approach, but results are quite good. Some companies still give interns the ability to talk for their brands. Maybe the same companies have a strong “permission to quote” policy in place. I hope they’ll get the importance of social media soon. It’s not hard throwing out sentences on how good we are. The thing is, you must be quick, good, professional and nice to answer to those (who might be very influent with their peers) that are complaining about you or your products. It’s advertising, and some kind of reverse (or adverse!) advertising. Another consideration: about half the companies are either using the marketing team or a digital team. Only half of them got it’s not a 1 person thing. Another possible answer was “Other”. I did not add it since it was about a 5% saying it was the owner doing it. Nobody answered with “everybody contributes, with a dedicated team (internal or external) to handle it strategically”. Which should be the right approach IMHO. Q. Considering your past experience with social media, are you planning to increase your budget for social media in 2012? Survey results have highlighted a mixed feeling about social media, as demonstrated in the previous figures. I wanted to see if the situation was going to chance in the 2012 fiscal. 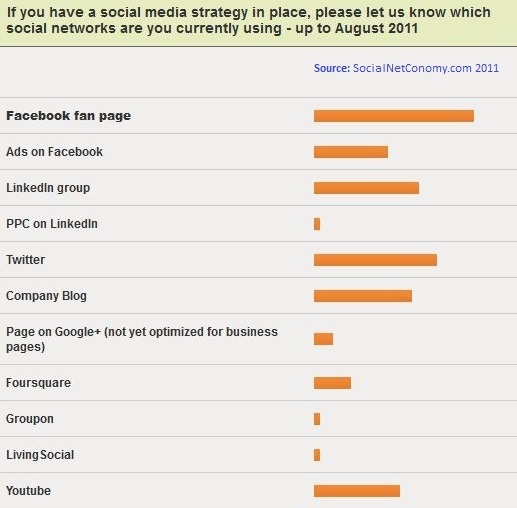 About 55% of companies are increasing their social media budget in 2012, and only between 2% and 3% are decreasing it. This is a very good sign, also given that this survey was running between August and October, and I have monitored it through the weeks and I can tell no crisis impact on this decision. This means only one simple thing: companies are getting it. Q. Where are you placing your Social Media dollars in 2012? With this question I wanted to understand “how much” companies are getting it. If they have learned what works, what does not, and how to improve their strategy. And, of course, I wanted to know where their social media dollars were going to in 2012. Again Facebook rules, but 10% of the surveyed companies are rather moving to other social networks and channels, more relevant for their business. Answers to this question also provide some outlook for all those copanies developing Facebook pages, or editing videos, or for those agencies providing social media guidance and execution: 2012 will see their business flourish. Again, no good news for Groupon and LivingSocial. The last question of this short survey was about possible inhibitors to social media. I have noticed this is maybe the first time when a technology, used, developed and shared between consumers, get to the business world. usually with technology companies are the first large users, and then it becomes more common. So why companies seem being so late to this (technology-based) date (on social media) with their clients? Q. 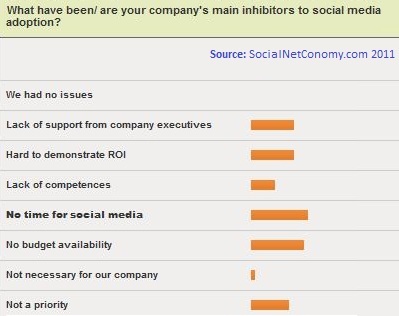 What have been/ are your company’s main inhibitors to social media adoption? No time for social media still tops the list of inhibitors (as found in many other surveys), and I keep wondering what should clients think of the fact that companies say they do not have time for their clients. Interesting to notice that nobody selected “We had no issues”. So everybody had some kind of issues. Other reasons such as lack of budget and lack of support from company execs are still among the main reasons. In some circumstances companies admit lack of competences – as well as the fact that demonstrating ROI is pretty hard. How do you compare with these results? Fascinating. I ran a similar survey earlier this year on UK B2B lead generation and lack of time and lack of budget were cited as the main obstacles there, too. thanks for your comment. The thing is, I read many surveys saying lack of time was the main inhibitor to social media… but I keep seeing people spending quite a good amount of time on social media (and you could not get to this survey until you are on social media). So my question would rather be: you DO have time for social media (you have time to browse facebook, linkedin, you have time to tweet out about stuff you do, you have got time to check in with foursquare.. Is there a reason why you say you don’t have time to do it for your business? 5 minutes a day, everybody in a company. That would make a difference! Do you agree? For Phil – I would be interested to see that report on the survey you did. Is there a link or way to see that?